Vitalii Sediuk, also known as "the red carpet prankster" and "the guy who punched Brad Pitt", has never been more famous. Or, rather, he's never been more infamous. 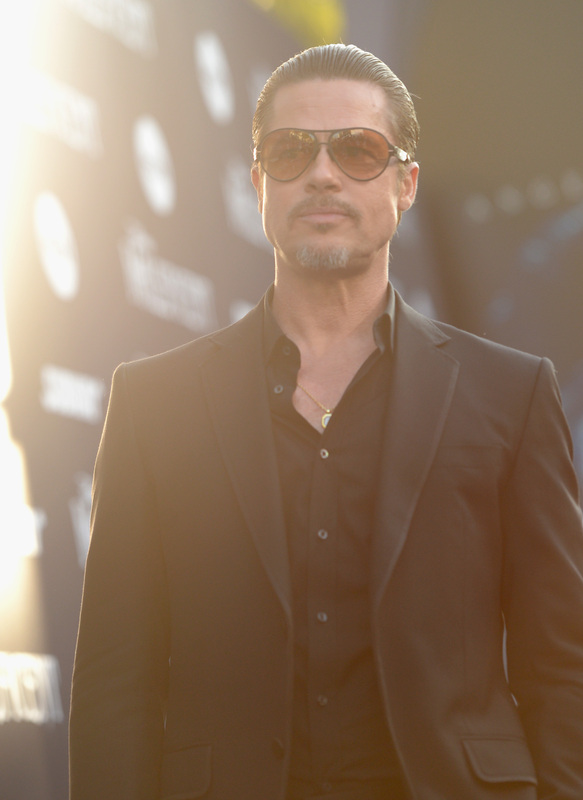 Despite the fact that Sediuk's assault on Brad Pitt at the Maleficent premiere was far from his first mean-spirited prank, it was that assault that made him a small-time celebrity. People might still be unclear on how to spell his name, but everyone's talking about him. Especially since Sediuk wore a Brad Pitt t-shirt to do his community service on Wednesday. After the attack, Sediuk was arrested, fined $200, and ordered to perform 20 days of community service. He was also given 36 months of probation and banned from attending all Hollywood events, something which probably should have happened after he was fired from Ukraine's 1+1 TV channel for crawling under America Ferrera's dress at the Cannes Film Festival. That all could have been the end of it, but now Sediuk is making a statement by doing his community labor with a picture of Brad Pitt on his shirt. The real question is exactly what kind of statement is Sediuk trying to make? The options here range from the obvious to the sincere. 1. This is his way of capitalizing on his infamy. Let's be real. Now that Sediuk has been caught and punished — and with so much else going on in the world — we're all going to forget about him pretty soon. At least until he pulls another stunt like this. By wearing a photo of Brad Pitt on his shirt, Sediuk is ensuring that everyone in the immediate area knows who he is and what he's done. Maybe he's even proud. 2. This is his way of apologizing. Since he's got no other way of contacting Brad Pitt to announce how sorry he might be, this could be the next best thing. After all, nothing says flattery like wearing someone's face on your chest. It's saying "I think you're really cool" and "Please forgive me" all in one semi-creepy action. 3. It's part two of the prank. If it hadn't been for that pesky restraining order, Sediuk was planning a second half of the prank where he swooped Angelina Jolie up into a bear hug while wearing a Brad Pitt t-shirt. All right, I don't know if that's true but it sounds like something he would do, doesn't it? Why let the shirt go to waste just because he didn't get to go through with it? It's still a form of capitalizing on his infamy, but maybe Sediuk is going to start making money by selling merchandizing based on his prank. Expect an America Ferrera, Will Smith, Adele, and Leonardo DiCaprio shirt to follow after the Brad Pitt shirts fly off the Internet shelves. 5. He just wanted to be meta. Hey, if Macaulay Culkin can wear a Ryan Gosling shirt and Nicholas Cage can wear a Nicholas Cage shirt, then why can't Sediuk join the ranks of the meta celebrities by wearing a Brad Pitt shirt? It's the in thing to do in Hollywood lately, you guys, and he's all about the Hollywood insiders. 6. He already owned, like, five of these.